A book that caught my eye, and as I have found out, I’ve ended up reading some books that I’ve enjoyed thoroughly when I pick books on impulse. 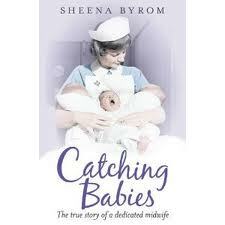 Catching Babies: The true story of a dedicated midwife is exactly what it says on the cover. Sheena Byrom’s story from the day she signed up to be a nurse, to the dedicated midwife she retired as. From a close-knit family of five sisters, Sheena had a very loving childhood. Sheena had to give up her studies after her A levels, when both her parents fell ill. Her parents needed her support financially and emotionally. While she was disappointed about leaving her studies, she understood that it was the need of the hour. Later her mother encouraged her to think about nursing as a profession. The idea of a job in a caring profession really appealed to her. About to turn eighteen, she went in for her nursing interview and got selected, much to her great joy. She started off as a nurse, but soon got attracted to midwifery after getting a chance to be at a birth. She recalls how she could still remember the thrill and pleasure that she felt while assisting with the birth. It was the first in many, many more to come. After qualifying as a nurse, she decided to apply to be a pupil midwife, as that seemed to be what fascinated her the most. Then on, it’s about her journey as a midwife. As she says, ‘I was to learn that the job satisfaction in midwifery came from doing less to individuals and doing more with them’. The narrative of her life as a midwife also charts the way the profession has changed over the decades and how so many dedicated midwives have helped change the childbirth experience to what it is today in Britain. From the days where a pregnant woman was treated as a ‘patient’ to the time when it is an experience of a lifetime for a woman, and the understanding that she needs to be the one to make the decisions for herself and her baby. Along with her narrative about her professional life, we get to see Sheena’s personal life, getting married to her boyfriend Paul, losing her father, her sister, giving birth to her babies, looking after her mother. The close bond between her and her family, the friends she makes along the way, the difficulties and trials they face as a family. It is a wonderful, positive read. Her passion for her vocation shines through. Her joy knows no bounds when her oldest daughter decides to become a midwife too. All was not rosy for her though. She found herself in the middle of a litigation case, where she knew that she had done nothing wrong, and yet, she gets defamed, and she and her family had a hard time while the case was ongoing. Despite her trials, she continues to be positive and even understand the family which decided to litigate. She understood their limitations and only wished she could do more to help them. As she recounts the stories, her passion and respect for a mother giving birth to a baby comes across so strongly, and also how having a dedicated midwife support you through a pregnancy can make a real difference to a woman’s experience of giving birth. She talks of dedicated midwives, nurses and consultants who put the women first, who listened to the pregnant women, and made all the difference. Sheena herself has worked in different areas,in close knit maternity units, as a community midwife, communicating, supporting women in all sorts of situations, some living in extreme poverty, farmers wives who are on their feet the very next day, women from immigrant families, teenage mothers. The basic need for all pregnant women is after all the same. One of the stories she recounts of a lady who had been so let down by the system, that she was extremely hostile to all the midwives, until she was listened to. All she wanted was for someone to actually listen to her worries and fears. The book gives a great insight into the lives of midwives in this country. The first time I encountered midwives was when I was pregnant with daughter. In India, I think the concept of a midwife is almost non-existent, atleast in urban cities. In the NHS, if the pregnancy is low risk and normal, the midwives are the ones who provide the care throughout the pregnancy. Reading this book, gave me a real perspective to life on the other side. It was a beautiful, warm read, which gives one a true insight into the lives of midwives, their struggles, triumphs and struggles. An absolutely recommended read. It is a hard-to-put-down book. I picked up this book reading the blurb. After a year on the streets treating outreach patients, Max Pemberton is back in the relative comfort of hospital. This time running between elderly care and dementia clinic to A&E and outpatients. No longer inexperienced(Max and his doctor friends can now tell when someone is actually dead, they are on the front line of patient care for better or worse. One of the non-fiction books that actually touched my heart, made me feel glad that there are doctors out there that care, not that one really doubts that, but sometimes it gets easy to wonder. He works with the A&E as well as at the dementia clinic and elderly care. He talks about how almost all doctors of other specialties can claim to have gotten their patients to recover, but someone working with the elderly and dementia, could probably never get to say that. The difficulties that both patients, care homes and doctors face in elderly care makes a heart-rending read. Especially impressive is the ways that nurses and carers find to work around difficult patients who have lost their memories, and try to live their lives with scraps of what they remember from their previous lives. Elderly patients who are themselves carers of older partners, and more worried about their partners than themselves, when they get admitted into a hospital for something like a heart attack. Some instances bring a smile to our faces, while some are heart-breaking. Along with his professional life, he also touches upon the personal lives of himself and his friends. The choices they make, and how life is never what it seems to be. How the most unlikely people turn up surprises of the most pleasant sort. It gives a real insight into the lives of medical professionals who battle with so many different things while providing us with healthcare of all sorts. Sometimes A&E staff is even forced to call upon firefighters to help, not once but twice. 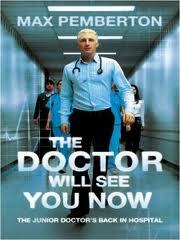 It gives a real insight into the NHS, the challenges and the opportunities that they face. Of how some doctors and medical professionals go that extra mile when it comes to patient care. Written with self deprecating humour, his deep dedication to his job, and his patients comes through in every page of this book. You reach the end of the book, hoping that it would go on and on. I haven’t read his previous books, but can’t wait to read them now. I wouldn’t miss them for the world. One of the best books I have read recently. I would give it a 4.5/5.